● Enjoy up to 20% off up to seven-day packages by using online coupon codes available from external coupon sites. ● Save up to $45 when you add a Hop on/off Bus Tour to your New York Pass purchase rather than buying it separately. ● Purchasing multi-day passes can save you hundreds of dollars compared to single day prices. Check for regular sales promotions like Summer Sales to enjoy even more discounted daily rates. ● New York Pass offers a money back guarantee for unused travel passes for an additional charge of 4.5% of your total order. New York Pass allows you to purchase one pass for all of the sight seeing options in New York City. There are different types of passes that range in the number of days that you can use the pass. Some of the packages allow for transportation costs as well. Pass holders are granted perks like being able to go to the front of the line at attractions to avoid long wait times. They also offer discounts on the passes that reduce the cost of paying for each attraction separately. You can order online. The pass is good for one visit to each attraction for the amount of days of purchase. 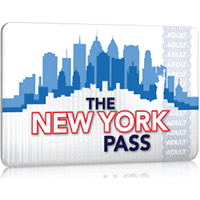 For most up to date offers check out New York Pass on Facebook and Twitter or contact New York Pass Support for any questions.